MELBOURNE — At age seven, Rafael Picón explored art by making small clay sculptures and encouraged his curiosity while helping his father and his uncle in their steel crafts for the churches and local buildings of the city. When he was 8 years old he managed to sell one of his works to the baker for five pesetas and with that money he bought one of his favorite toys, a top. Today, this sculptor born in Andalucia, Spain is an expert in creating works with metal, glass, copper, bronze, wood, marble, silver, gold and ceramics. He describes his work as “Functional Art”. For 43 years he has been living in the United States, a country that he considers his “father”, not forgetting his mother Spain. He arrived on American soil at the age of 19, inspired by how much the mother of his first son loved the country. She moved to this country with her family after her father was sent to the United States Air Force from Madrid Spain. One of the most important works of Picón was the creation of the statue of Juan Ponce de León. This work that features the Spanish explorer and conquistador holding a cross and facing the Atlantic Ocean was built in bronze and is 10 feet high. It has been one of the centerpieces of Melbourne Beach since 2013. To do research for the sculpture, Picón went to Spain to study the Spanish explorer facial expressions and the characteristics of his uniform. “It’s hard to imagine what a person would look like 500 years ago. You have to see it in your mind before you can do it in clay,” he said. Despite having more than 40 years of artistic career experience, Picón says he still has a lot of more to learn. 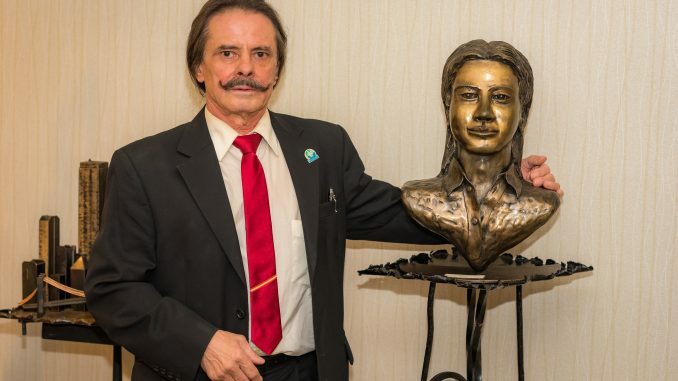 “As a sculptor, the hardest thing is to allow stubbornness because sometimes you have to be stubborn and constant to achieve the goal of creating what you see in your mind and getting around the obstacles that come along the way,” he said. He is currently working on his new sculpture. This is the 24-foot Cross of Christ that will be located in the St. Mary Catholic Church in Rockledge. The cross, with an internal skeleton of galvanised iron is filled with 1,400 pounds of cement, and a finish of terra cotta color. The sculpture of Jesus Christ is in process and is expected to be presented on Easter of 2017. “Many years ago I wanted to make a Jesus Christ sculpture and this year for Easter, I woke up with the initiative that I had to start right now. I spoke with the priest of the church and he was happy with the project,” said Picón. His first exhibits were shown after his arrival in the United States in 1974 in art galleries around the country at the same time in Spain. Currently, Picon is a member of the Florida Association of Public Art Professionals (FAPAP) and Brevard Cultural Alliance. He also works simultaneously for several galleries. “For me, art is difficult to describe because it is a hidden world to express. Art must leave the spectator perplexed, it must have charisma, harmony and beauty,” the artist shared. He explained that he chose this expression of art because it is tangible and can be felt. “The sculptures are like trees that express themselves but do not move,” he said. The biggest achievements in his career have come from creating all of his works from a personal point of view. Although he says it is difficult to live of art all the time, during the last 14 years he has lived in Florida, he has taken his art as a full time job. “Basically I had to alternate my passion with other jobs that would give me an economic remuneration to take care of my responsibilities as a head of the family. But having already fulfilled that role, I decided to dedicate myself completely to what I like,” said the artist. Regarding his future projects, Picon said he will work on some sculptures that will be exhi-bited at the Picasso Museum in Madrid. His works are displayed throughout the country, as well as in different spots in Spain, Barcelona, Madrid, Valencia, Alicante, Toledo, and Ciudad Real. The museums of Art In Orlando, Tallahassee, Miami, and Santa Fe, New Mexico also exhibit Picon’s art. Locally, his work is exhibited at the King Center, Busch Gardens, Saint Mary’s Catholic Church and in local galleries.